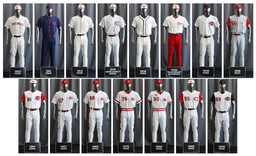 CINCINNATI (AP) The Cincinnati Reds are fashionably celebrating the 150th anniversary of the professional baseball-pioneering Red Stockings team. "From a historical point of view and in the evolution of baseball as the national pastime, the 1869 Red Stockings were the cornerstone," said Greg Rhodes, the Reds team historian and co-author of "The First Boys of Summer." "It's hard to imagine the modern game of baseball without the Red Stockings."